This is my first try at anything steampunk. And it actually the first time that I'm going to be in one of these contests. It's even the first time I build a y-wing. I never found it inspiring enough for some reason... Until now! Building this was a lot of fun. And since it is for the contest I'll guess I'm going to continue tweaking it for a while. As it is now it is sort of streamlined and quite close to the original y-wing and I will add some more stuff to it. Among other things wheels. It seems to be a lot of different approaches to this steampunk style. What I'm aiming for is not so much the post appocalyptic junk built vehicles, but rather a 50/50 mix between Star Wars and Jules Werne. I think that the thing with Star Wars is that you can't just use the basic shape under a lot of stuff because what makes it Star Wars for me is more the whole blend of streamlined beauty and boxy heaviness. So what do you think about this Y-wing steamfighter? Nice transformation! I will only complain about a couple of things, the front end looks way too sleek for steampunk, I recommend replacing the canopy with a roll cage. The guns on top look a bit too plain, like you lost inspiration at that point, those would look great replaced with a gatling-gun. As a personal suggestion, it would be fun to build some small wing-tips over the engines, make it look like it actually has a bit of wings on the sides. good luck in the contest! An excellent build, though I agree with Olog. The front is way too streamlined, and kind of breaks from the rest. Glass isn't that common in Steampunk, except as the occasional porthole or window. The front shape could work, if it was more jagged and less smooth. Beyond that, some pictures with better lighting could help this. The high contrast shot is nice, but the rest are somewhat dark. Good build! I really like the small windows in the aft portion of the cockpit. Your use of rowboats is excellent as well. Olog is right about the top turret as well- it just doesn't look very steampunk. You have a good entry now- keep refining and you'll have an excellent one! Hawt. Love it end to end, but I agree it would look more steampunk'd if the windscreen was a cage or at least not as sleek as that particular one, and the two large slopes up front were replaced by a more paneled construction like staggered slopes or snotted tiles. One added benefit of this contest is the great incarnations of R2 as a steam droid... yours is really nice. Isn't it funny how everyone has commented on the windscreen? I'm going to make a change! 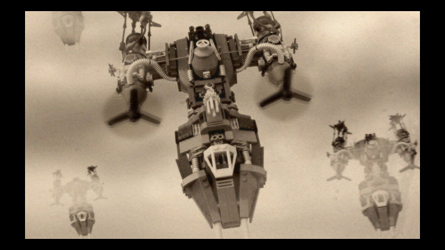 I love the propellers in front of the engine pods, those make the engine pods still seem like engines. That big boiler behind the garbage astromech looks nice there too, and the wheel on the top is a good top-off. I love all of the pipes sprouting from everywhere on this thing. Oh, and that windscreen looks out of place. Very nice use of the boats in the conjunction section, perfect fit! The overall look is wonderful, but i think it would be beneficial to add more propellars to your engines. That is beautiful! 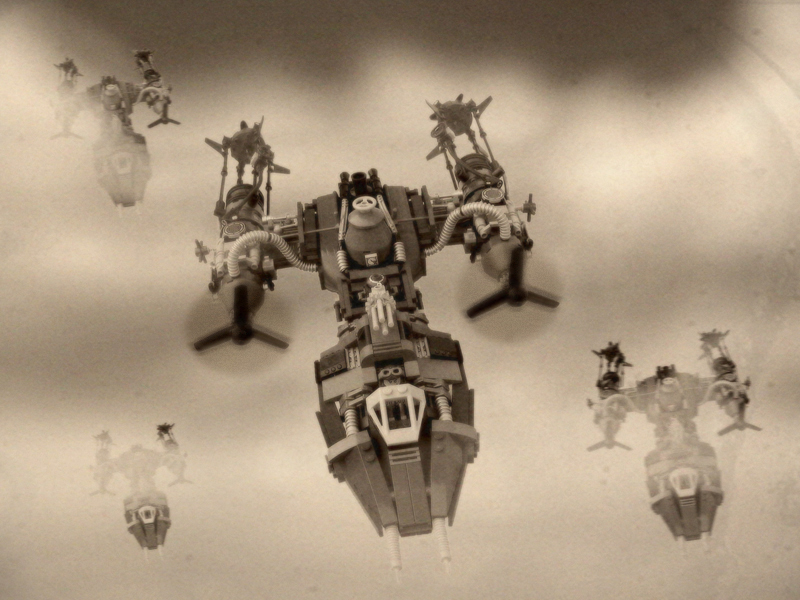 You captured the ship very well in steampunk! I love all the details you put into the ship! Fantastic job! I was looking at this in my computer class, earlier. Really good. I especially like the use of the boat hulls. A very subtle effect. You fail, thats what I built too except this one is much better. I think you should have an open cockpit though. other than that, its great! Thanks for all the comments. And thanks for helping me see where it needed some more work. It's a classic example of "kill your darlings" really. Even I thought the cockpit looked a bit too modern perhaps, but I just loved the WWII feel to it. Now I've almost completely reworked the cockpit. It still looks a lot like the original ship, but now with more edges and without the smooth windscreen. I only have this one picture now, but I'm going to have all new pictures of the whole thing up soon. So what do you think now, better or worse? Now the cockpit sorta sticks out a lot, being in with all that brown. I know this will probably borderline infuriating, but I think it's a step too far from the sleekness. If there's a spot directly between the two version, I'd say it would be perfect... maybe if this new style could have been accomplished with a few less visible studs I'd like it as much as the overly modern original. But total score on the simple replacement for the windscreen. It works. I have to agree with The Don. I think you were almost there with the first iteration. How about using a smaller glass windscreen as sort of a "wind block" similar to what some of the old WWI aircraft had. or the 2 stud wide version. I do not like the new cockpit at all. I think it looked better with the slick glass. Some steam punk vehicles are smooth. Well.. Some good points again. Thank you all. I'm going to keep this window now and try to do something more interesting with the rest of the front end of the ship. Steamier stuff. I'll be back. Wonderful color scheme! I am late in pointing this out, but I also love the boat hulls. As far as the cockpit goes, s combination of very simplistic windscreen elements (like the one suggested by RocketSeason) and some brown/black rollcage looking things may be nice. I feel that such a combo would match your very excellent rear side windows. I'm now satisfied with my contest entry. New cockpit again and some new details added all over the ship. I've been working on a cockpit that goes a lot better with the rest of the ship. And now it has wheels to land on as well. Check it out. Glorious. Fantastic build all around man, the cockpit looks perfect now and I love that you added the landing gear. The more i look at this the better it gets. The use of the rowing boats is a great idea and seemlessly executed. Great stuff. Wow, awesome, especially the inspired use of boat hulls. The greebling at the back really catches the eye as well. 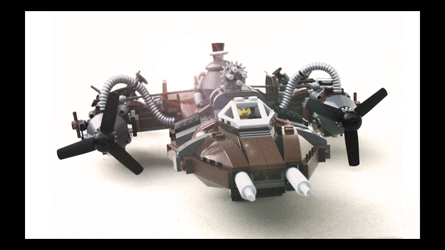 This is an utterly sweet moc all around. The nose looks a lot better than the earlier versions. Darn good job. The more I look at it the more I like it. It really is beautiful, one of the best in the whole contest. I'm glad that you liked the modifications. And since I needed that little extra push forward, I have to thank everybody that helped me on this. There is a lot of inspiration to get from the other entrys as well. The steampunk theme was a lot more fun than I would have thought. I'm allready working on another SW steampunk project outside of the contest just to keep me busy while the judges are doing their thing. Since there obviously where so many different ways to do the blend between SW and steampunk I decided to try building yet another one in this rather sleak style. It's going to be fun to see for how long time this theme will keep popping up here after the contest has ended. never really liked the y-wing and never tried to build one before. 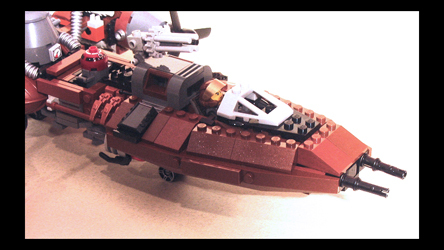 When I was playing around with all kind of brown and steampunkish pieces, I realized that the two boats would make a perfekt middle section for a y-wing. From there the build was somewhat easy, apart from the cockpit of cource, that was a challenge. I think the boats was a good way to build the middle section, because a y-wing is all about the greebling. And without the smooth wooden boat hulls it would have been in danger of beeing just a regular y-wing made in brown. I think the funniest part of building for the contest was to adept a new style of using color and odd looking details. I'm going to try working a little bit more like this even when I build regular SW. It's so easy to think that there are those rigid rules on how to build SW and what color to use. I you think about it, the source material is a lot of junk built stuff in a "used universe" and really need a lot of strange colors and off details to look right. What do you think, any more comments on this steam creation? Hello again. Take a look at this old style photo I've made, featuring my steam powered y-wing. Wow, it looks especially fantastic in black and white, it really feels the part. dude u have insane creative skills, very nice!